Finding chocolate in Bruges is easy. However, the problem for the day-tripper is more likely to be one of over-choice rather than scarcity. This fairytale Belgian city—known primarily for its white swans, Venice-like canals and medieval architecture—is a virtual Candyland. Remember this game of your childhood? Tempting shop windows laden with displays of sweets easily seduce passersby on every street in the historic city center. When their doors open, the scent of chocolate seems to waft in the air. Of course, Belgian chocolates (along with Belgian waffles and Belgian beer) are ubiquitous not only in Bruges but in other cities in Belgium that welcome large numbers of tourists (e.g. Brussels, Antwerp, Ghent, etc.). Why not? Chocolates, waffles and beer are the perfect trifecta for visitors seeking an immersive experience that’s also intoxicating! What exactly are Belgian chocolates? Despite the country’s long history as a producer dating back to the 1600s, standards for Belgian chocolate still remain loosely regulated. To carry the label “Belgian chocolate” a confection needs only to contain a certain level of cocoa (at least 35%) and has to be produced within the borders of the country whose name it carries. The raw ingredients used to make the chocolate (such as cocoa beans) are imported. There are two major types of Belgian chocolates, truffles and pralines. Truffles are soft and filled with buttercream; pralines have a hard chocolate shell with a variety of fillings. A major appeal of Belgian confectionaries is that they are often handmade by small producers. Switzerland, the U.S., Germany and Belgium are the top four countries chocolate producers in the world. Among them, Belgium is the largest exporter of its chocolate, known for its excellent quality. We recently returned to Bruges, Belgium as part of an on-our-own shore excursion on the Viking Star. With a population of less than 20,000 living in the city center, Bruges welcomes some nine million visitors a year and has a booming commercial center. The cruise line’s tour bus took us on the half-hour drive from the port where our ship was docked to the entrance to the city. On the bus, the local guide warned everyone about the sweet temptations we would face in Bruges. She cautioned us to be wary of chocolates priced less than 22€ per kilo in tourist shops because they weren’t likely to be of good quality. Above that price, it would be hard to make real mistakes. Arriving early morning, we strolled through the city’s winding cobblestone streets poking our noses into churches, museums and small shops before the hoards of other tourists descended. Locals with shopping carts were on their way to Bruges main square (called the Markt), where a weekly market has been held since 985. On one of the major shopping streets, an inviting Neuhaus Chocolate shop called to us and we simply couldn’t resist. The friendly shopkeeper, Marlene, explained that in 1857, Jean Neuhaus, a Swiss pharmacist, opened a boutique in Brussels that sold both medicine and chocolate. He combined the two sides of his business by conjuring up the idea of covering sour-tasting medicine in dark chocolate to make it more palatable. (Hate to mention this but if you are baby boomer, you may associate Neuhaus’ “invention” with the Ex-Lax chocolate squares that were once popular in the 50s as a remedy for constipation). Eventually, sales of the delicious chocolates predominated and the pharmacy became a boutique candy shop that still exists in Brussels. In 1912, Neuhaus’ grandson, also named Jean, cemented the significance of his family’s role in the chocolate industry by inventing the first praline, the term commonly used today to describe any filled chocolate. Another family member also enhanced the success of this 160-year old, seven-generation business—which has grown to include outlets in 50 countries around the world. In 1915, Louise (the younger Jean’s wife) designed elegant packaging for the chocolates in the form of an attractive cardboard box with flaps, called a ballotin, which remains a hallmark of Neuhaus chocolates today. It raised the platform of chocolate to that of a luxury gift. 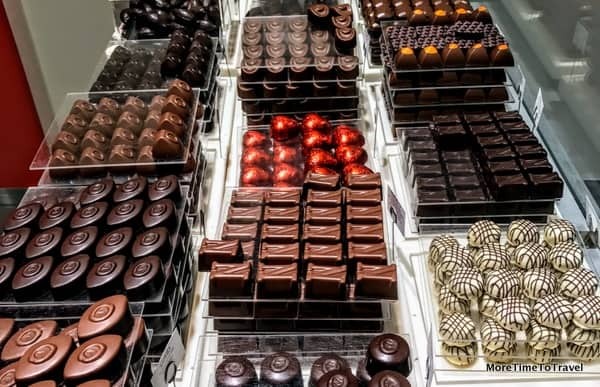 The shelves of the Neuhaus Chocolate factory store in Bruges offer a dazzling display of chocolates, available both pre-packaged and by weight at the counter. Marlene offered us a complimentary “gateway” taste. Of course, without any pressure from Marlene, we purchased some to take back to the ship, dark chocolate covered orange peel and “Cornet Dore,” miniature cones filled with Gianduja (an Italian blend of hazelnuts and chocolate). We also bought colorful sleeves with cubes of wrapped chocolate to take home as gifts. How can we describe the taste and texture at the source? Uber rich and smooth, satisfying in small quantities. Warning: Tasting these luxury chocolates can lead to a serious addiction. We were delighted to learn that Neuhaus has a flagship store on Madison Avenue in New York City! There are two Neuhaus Chocolate shops in Bruges, a stone’s throw from each other but only the one at Steenstaadt 66 is a factory store. The original Neuhaus store is still open for business in Brussels at the Galeries Royales. Bloomberg recently named Neuhaus truffles the best chocolate truffles in the world. We were told that the ice cream in the Neuhaus shops is worth tasting, too. Noteworthy: The Leonidas chocolate shop on the same street offers a lower-cost but excellent alternative; it is a favorite of many Europeans). Chocoholics visiting Bruges may want to make a pilgrimage to Choco-Story, a unique chocolate museum that tells the history of cocoa and chocolate. Yearning to taste Neuhaus chocolates? Tasted them before and still addicted? A wide variety of Neuhaus chocolates are available on Amazon.com. Had to read your post because I loved visiting Bruges and love chocolate! Your picture of the store window, “Chocoholic” was perfect! Very interesting comment about the quality of chocolate and paying more than 22€ per kilo. Wow! What will be interesting to hear (from you) is how much chocolate survived the journey home. How can you resist! Absolutely love Brugge and of course the chocolate shops there. We are thinking of doing a cruise next year, I’ll have to check for itineraries that include a stop in Brugge…it would be nice to go back. It’s a great place to visit! Hope you get there! My husband is the chocoholic in our family so I can only imagine how he would react to all this chocolate in Bruges! The dark chocolate covered orange peel sounds divine… I learned a lot from your post! Dark chocolate covered orange peel is my husband’s favorite too! It’s a long time since I’ve been to Bruges but I remember those shop windows with the wonderful chocolate displays. Belgian chocolate is always beautiful to look at – it almost seems a pity to eat it! Yes, the chocolate makers of Bruge are really artisans! We have never visited Bruges, but we are certainly fans of chocolate. On occasion we have had the opportunity to visit some bean-to-bar chocolatiers, and are always amazed at the dedication of the staff. Thanks for sharing this handy, and informative guide to chocolate in Bruges. Bruges is a beautiful town, chocolate just makes it sweeter! Lovely post, Irene. I somehow never made it to Bruges when I was in Belgium investigating Chocolate. Would definitely love to return and check out this beautiful city and shop its chocolate offerings. I’m sure you would love it, Doreen! You are right — it’s difficult to describe the taste of good chocolate confections. I’ve not been to Bruges, but have enjoyed fabulous chocolates in Germany. They just know how to do it right! Thanks for the delicious peek at chocolates in Bruges! Oh how we loved Bruges when we did our cruise 🙂 And the Belgian chocolate – yes to die for. We also loved the chocolate shops and marvelled at the array and diversity. Such a pretty place – the beer and the mussels weren’t bad either! Agree! I would love to rent an apartment and spend time in Bruges. Belgian cuisine is amazing! I was in Bruge last year and loved the city. It is so charming. Your chocolate overview makes me want to go back. Okay, I am drooling reading this and looking at the gorgeous photos! Bruges is high on my list of places to travel next, and I would love to eat my way through the city’s chocolate shops! You’re my kind of lady! Between you and Doreen I think I’ve just gained five pounds. A great article that will definitely go ‘in the file’ for future travels. We’ve loved the Swiss chocolate in Geneva so I am certainly we need to sample some in Bruges for comparison purposes! Great post! So many places to travel and sample chocolate! Thanks for taking me down memory lane this morning. We were like kids in the perfect candy store when we visited Bruges. Walking down the streets with chocolate store after chocolate store it’s a wonder we ever left. I loved seeing the classic board game ‘Candyland’ too. Great story Irene.